I had read too many books by Englishmen and New Englanders to want to know anything but graceful things and erudite things and the look of white frame houses on green lawns. I could always console myself by thinking my brains would make me famous (brains were good for something, weren't they? ), but then my children would have good childhoods - not me. I was irrevocably deprived, and it was the irrevocableness that hurt, that finally drove me away from any sensible adjustment to life to the position that dreams had to come true or there was no sense in living at all. If dreams came true, then I would have my childhood in one form or another, someday. I was fierce and solitary and acrid, marching off the little mile from school, past the post office, all yellow brick and chrome, and my two locust trees, and there was no one who loved me first. I could see a hundred cravennesses in the people I knew, a thousand flaws, a million weaknesses. If I had to love first, I would love only perfection. Of course, I could help heal the people I knew if I loved them. No, I said to myself, why should I give them everything when they give me nothing? 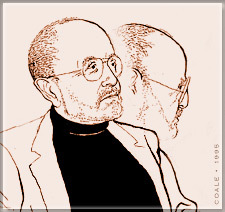 Image: Brodkey, drawn for The New Yorker in 1995. Scalding excerpts. The character reminds me of Sredni Vashtar. I thought so too. Reading non-fiction is so much more comfortable. sigh... Here I go again. When I click into 'books' at Amazon, a loud voice comes through my computer and yells: HOWDY, AMY! "We'll have this book to you in 48 hours!" My library is The Clemantis of Books Atelier.